(ăr'ĭstŏt`əl), 384–322 B.C., Greek philosopher, b. Stagira. He is sometimes called the Stagirite. school founded by Plato near Athens c.387 B.C. It took its name from the garden (named for the hero Academus) in which it was located. Plato's followers met there for nine centuries until, along with other pagan schools, it was closed by Emperor Justinian in A.D. 529. ..... Click the link for more information. and there wrote many dialogues that were praised for their eloquence. Only fragments of these dialogues are extant. He tutored (342–c.339 B.C.) Alexander the Great at the Macedonian court, left to live in Stagira, and then returned to Athens. In 335 B.C. he opened a school in the Lyceum; some distinguished members of the Academy followed him. His practice of lecturing in the Lyceum's portico, or covered walking place (peripatos), gave his school the name Peripatetic. During the anti-Macedonian agitation after Alexander's death, Aristotle fled in 323 B.C. to Chalcis, where he died. Aristotle's extant writings consist largely of his written versions of his lectures; some passages appear to be interpolations of notes made by his students; the texts were edited and given their present form by Andronicus of Rhodes in the 1st cent. B.C. Chief among them are the Organum, consisting of six treatises on logic; Physics; Metaphysics; De Anima [on the soul]; Nicomachean Ethics and Eudemian Ethics; De Poetica [poetics]; Rhetoric; and a series of works on biology and physics. In the late 19th cent. his Constitution of Athens, an account of Athenian government, was found. the systematic study of valid inference. A distinction is drawn between logical validity and truth. Validity merely refers to formal properties of the process of inference. a mode of argument that forms the core of the body of Western logical thought. Aristotle defined syllogistic logic, and his formulations were thought to be the final word in logic; they underwent only minor revisions in the subsequent 2,200 years. ..... Click the link for more information. was the sequence that all logical thought follows. He introduced the notion of category into logic and taught that reality could be classified according to several categories—substance (the primary category), quality, quantity, relation, determination in time and space, action, passion or passivity, position, and condition. in philosophy, the relationship between cause and effect. A distinction is often made between a cause that produces something new (e.g., a moth from a caterpillar) and one that produces a change in an existing substance (e.g., a statue from a piece of marble). ..... Click the link for more information. , or why it is. He posited four causes or principles of explanation: the material cause (the substance of which the thing is made); the formal cause (its design); the efficient cause (its maker or builder); and the final cause (its purpose or function). In modern thought the efficient cause is generally considered the central explanation of a thing, but for Aristotle the final cause had primacy. He used this account of causes to examine the relation of form to matter, and in his conclusions differed sharply from those of his teacher, Plato. Aristotle believed that a form, with the exception of the Prime Mover, or God, had no separate existence, but rather was immanent in matter. Thus, in the Aristotelian system, form and matter together constitute concrete individual realities; the Platonic system holds that a concrete reality partakes of a form (the ideal) but does not embody it. Aristotle believed that form caused matter to move and defined motion as the process by which the potentiality of matter (the thing itself) became the actuality of form (motion itself). He held that the Prime Mover alone was pure form and as the "unmoved mover" and final cause was the goal of all motion. , philosophy and theology of Western Christendom in the Middle Ages. Virtually all medieval philosophers of any significance were theologians, and their philosophy is generally embodied in their theological writings. ..... Click the link for more information. ; much of Roman Catholic theology shows, through St. Thomas Aquinas, Aristotelian influence. There has also been a revival of Aristotelian influence on philosophy in the 20th cent. His teleological approach has continued to be central to biology, but it was banished from physics by the scientific revolution of the 17th cent. His work in astronomy, later elaborated by Ptolemy, was controverted by the investigations of Copernicus and Galileo. See edition of his works by R. P. McKeon (1941); J. H. Randall, Aristotle (1960); G. E. R. Lloyd, Aristotle (1968); J. Barnes, Aristotle (1982); J. D. Evans, Aristotle (1987); J. Lear, Aristotle (1988); T. Irwin, Aristotle's First Principles (1989); A. M. Leroi, The Lagoon: How Aristotle Invented Science (2014). (384-322 BC) major Greek philosopher and tutor of Alexander the Great, whose influence on European thinking has been extensive. This influence is seen in the development of natural science, of political science, within early anthropology and above all in PHILOSOPHY (including LOGIC and ETHICS). Aristotle studied at PLATO's academy in Athens, but, though influenced by Plato's IDEALISM, he is usually regarded as a representative of the EMPIRICIST wing of philosophy. Where relevant, his method of inquiry involved careful observation and reporting. On the other hand, he also initiated the systematic study of logic. In practice, therefore, reason and empiricism were combined in his work. Born 384 B.C. ; died 322 B.C. Ancient Greek philosopher and scholar. Aristotle was born in Stagira and moved to Athens in 367. He became a student of Plato and was a participating member of Plato’s Academy for 20 years, until Plato’s death in 347. In the year 343, Aristotle was summoned by Philip, king of Macedonia, to tutor his son Alexander. In 335, Aristotle returned to Athens and there established his own school (the Lyceum, or peripatetic school). He died in Chalcis on the island of Euboea, where he had fled from persecution arising from accusations of a crime against religion. He was an advocate of a moderate form of democracy. The works of Aristotle that have come down to us may be divided into seven groups according to their contents. They are (1) logical treatises, collected in the compilation entitled Organon, which include Categories (Russian translations, 1859, 1939), On Interpretation (Russian translation, 1891), Prior and Posterior Analytics (Russian translation, 1952), and Topics; (2) physical treatises, including Physics, On Coming to Be and Passing Away, On the Heavens, and On Meteorological Questions; (3) biological treatises—History of Animals, On the Parts of Animals (Russian translation, 1937), On the Origin of Animals (Russian translation, 1940), and On the Movement of Animals, as well as the treatise On the Soul (Russian translation, 1937); (4) works dealing with “first philosophy” which consider being as such and consequently have received the title Metaphysics (Russian translation, 1934); (5) ethical works—the so-called Nicomachean Ethics (dedicated to Nicomachus, Aristotle’s son; Russian translations, 1900, 1908) and the Eudemian Ethics (dedicated to Eudemus, Aristotle’s student); (6) sociopolitical and historical works—Politics (Russian translations, 1865, 1911), the Athenian Constitution (Russian translations, 1891, 1937); and (7) works about art, poetry, and rhetoric, including Rhetoric (Russian translation, 1894) and the incompletely preserved Poetics (Russian translations, 1927, 1957). Aristotle embraced almost all the branches of knowledge accessible in his time. In his “first philosophy” (“metaphysics”), he criticized Plato’s doctrine of ideas and provided a solution to the ontological relationship between universals and particulars. The particular is that which exists only “somewhere” and “now”; it is perceivable by the senses. The universal is that which exists in any place and at any time (“everywhere” and “always”), and appears under definite conditions in the particular, through which it becomes known. The universal constitutes the object of scientific knowledge and is attained by the mind. In order to explain what exists, Aristotle employed four causes: (1) the essence and core of being, by means of which every object is what it is (formal cause); (2) matter and what lies beneath it (substratum)—that out of which something originates (material cause); (3) moving cause, the beginning of motion; and (4) final cause—that for the sake of which something is done. Although Aristotle acknowledged matter as one of the first causes and considered it to be a certain kind of essence, he saw in it only a passive principle (a potential to become something). Moreover, he attributed all activity to the remaining three causes; to the essence of being—form—he ascribed eternity and immutability, and he considered the source of all motion to be the unmoved but moving principle—god. Aristotle’s god is the “prime mover” of the world, the highest goal of all forms and formations developing in accord with their own laws. Aristotle’s doctrine concerning “form” is the doctrine of objective idealism. Nevertheless, as Lenin remarked, this idealism is in many respects “more objective and removed, more general than Plato’s idealism, and therefore in natural philosophy it is more often equal to materialism” (Poln. sobr. soch., 5th ed., vol. 29, p. 255). Motion, according to Aristotle, is the transition of something from a potential to an actual state of being. Aristotle distinguished four kinds of motion: qualitative, or change; quantitative—increasing and decreasing; displacement—spatial movement; and coming to be and passing away, which could be included among the first two kinds. In his doctrine of knowledge and its aspects, Aristotle distinguished “dialectic” from “apodictic” knowledge. The sphere of the former is “opinion” gained from experience, whereas the sphere of the latter is trustworthy knowledge. Although opinion may also attain an extremely high level of probability in its content, Aristotle considered that experience is not the last instance of trustworthiness in knowledge because the highest principles of knowledge are directly contemplated by the mind. 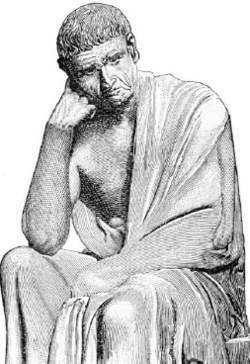 Aristotle saw the goal of scientific knowledge as the complete definition of an object, achievable only by combining deduction and induction: first, knowledge about each separate property must be gained from experience and, second, the conviction that this property is essential must be proved by the conclusion of a special logical form—the categorical syllogism. With his doctrine of proof, the research on the categorical syllogism conducted by Aristotle in his Analytics became the central part of his logical teaching. Aristotle understood the connection between the three terms of the syllogism as a reflection of the connection between consequence, cause, and causal agent. The basic principle of the syllogism expresses the connection between general class, less general class, and the particular object. The aggregate of scientific knowledge cannot be subsumed under a single system of concepts because there is no such concept which could be the predicate of all the other concepts. For Aristotle, therefore, it seemed necessary to indicate all the higher general classes—the categories—under which the remaining classes of being could be subsumed. Aristotle’s cosmology, for all its achievements (the inclusion of all visible celestial phenomena and the movements of the stars in one harmonious theory), was in several respects backward compared to the cosmology of Democritus and the Pythagoreans. The influence of Aristotle’s geocentric cosmology remained paramount until the period of Copernicus. Aristotle was guided by the planetary theory of Eudoxus of Cnidos, but he ascribed a real, physical existence to the planetary spheres. In this view, the universe consists of a number of concentric spheres moving at various speeds and driven into motion by the extreme sphere of the immovable stars. The “sublunar” world—that is, the region between the moon’s orbit and the earth’s center, is an area of disordered, uneven movements, and all the bodies in this region consist of the four lower elements—earth, water, air, and fire. As the heaviest element, the earth occupies the central position, and above it in sequence are distributed encircling layers of water, air, and fire. The “superlunar” world—that is, the region between the moon’s orbit and the extreme sphere of the immovable stars, is an area of eternally even movements, whereas the stars themselves consist of a fifth, most perfect element—the ether. In biology one of Aristotle’s meritorious services is his doctrine of biological expediency, based on observations of the expedient structure of living organisms. Aristotle saw examples of nature’s expediency in such facts as the growth of organic structures from seeds, the various manifestations of the expeditiously acting instinct among animals, the mutual adaptability of their organs, and so on. In his biological works, which served for a long time as the fundamental source of knowledge in zoology, Aristotle provided a classification and description of numerous animal species. The body was considered to be the material of life, whereas its form was the soul, which Aristotle called entelechy. Corresponding to the three main classes of living beings (vegetable, animal, and human), Aristotle made the distinction between three souls, or three parts of the soul—vegetative, animal (capable of sensation), and rational. In ethics Aristotle placed above everything the contemplative activity of reason (dianoetic virtues), which, in his opinion, contained in itself its own particular pleasure, strengthening its energy. In this ideal was expressed the separation—characteristic of slave-owning Greece during the fourth century B.C.—of physical labor, which was the fate of the slaves, from intellectual labor, which was the privilege of free citizens. Aristotle’s moral ideal was god—the most perfect philosopher, or “thought thinking itself.” The ethical virtue, which Aristotle conceived as the rational regulation of one’s activity, was defined by him as the mean between two extremes (“metriopathy”). For example, generosity is the mean between miserliness and squandering. Art was regarded by Aristotle as a special kind of cognition, based on imitation. He ranked it as an activity which depicts that which could be on a higher level than historical knowledge, which has as its object the reproduction of momentary, individual events in their bare, factual nature. This view of art allowed Aristotle (in his Poetics and Rhetoric) to develop a profound theory of art, close to that of realism. He also put forth a doctrine of artistic activity and theories concerning the epic and drama. Aristotle distinguished three good and three evil forms of governing a state. He considered those forms good within which the possibility for making a profit from the use of power was excluded and wherein power itself would be used to serve the entire society. Such forms include monarchy, aristocracy, and “polity” (the power of the middle class), based on a combination of oligarchy and democracy. Tyranny, pure oligarchy, and extreme democracy, on the other hand, were considered by Aristotle to be the evil, degenerate variations of these forms. As an advocate of the city-state (polis) ideology, Aristotle was opposed to large state formations. He based his theory of the state on an enormous amount of factual material on the Greek city-states which he had studied and which had been collected in his school. The doctrine of Aristotle, whom Marx called the summit of ancient Greek philosophy (see K. Marx and F. Engels, Iz rannikh proizv. 1956, p. 27), had an enormous influence on the subsequent development of philosophical thought. On the basis of his ethical and psychological conceptions, Aristotle developed a theory of education for “freeborn citizens.” According to Aristotle, the three aspects of the soul should have three corresponding and interconnected aspects of education—physical, moral, and intellectual. The goal of education consists in developing the higher aspects of the soul, both rational and animal (the will). Natural endowments, habits, and intellect are in Aristotle’s opinion the motivating forces of development upon which education must be based. Aristotle was the first in pedagogic history to attempt to divide education into periods according to age. Regarding education as a means for strengthening the state structure, he considered that there should be only state-administered schools and that in them all citizens except slaves should receive the same education, which would orient them toward state order. Aristotle’s economic doctrine was based on the premise that slavery was a natural phenomenon and must always be the basis of production. He studied the relationships between goods and money and came close to understanding the difference between a natural economy and the production of goods. Aristotle distinguished two kinds of wealth—the aggregate of consumer values in use and the accumulation of money (or the aggregate of exchange values). The source of the first kind of wealth was considered by Aristotle to be production—agriculture and crafts—and he called it natural production since it arises as a result of productive activity directed at satisfying people’s needs and because its scope is limited by those needs. The second kind of wealth was called unnatural by Aristotle because it arises from circulation; it does not consist of objects of direct consumption, and its scope is in no way limited. Aristotle divided the study of wealth into economics and chrematistics. He understood economics as the study of natural phenomena connected with the production of consumer values. In this he also included small-scale trade necessary for the satisfaction of people’s needs. Aristotle understood chrematistics as the study of unnatural phenomena connected with the accumulation of money; he included large-scale trade in this category. Aristotle regarded chrematistics negatively. Contrasting economics with chrematistics led Aristotle to an analysis of the inner nature of goods and their exchange. He was the first to note the distinction between value in use and exchange value. He attempted to analyze exchange value, but since he did not understand labor’s role in the creation of the value of goods, he asserted that only money makes it possible to compare various goods. Marx wrote: “Aristotle’s genius is revealed precisely in the fact that he discovered the relationship of equivalence in expressing the value of goods” (K. Marx and F. Engels, Sock., 2nd ed., vol. 23, p. 70). Marx also noted that Aristotle provided a splendid explanation of how the need arose to assign the character of money to a specific good that has value from exchange trade between various communities (Ibid., vol. 13, p. 100, note 3). But Aristotle did not understand the historical expediency of money, and he considered that it had become the universal means of exchange as a result of agreement. Aristotle regarded money as a means of circulation, a measure of value, and accumulated wealth. Aristotelis opera, vols. 1–5. Published by Academia Regia Borussica. Berlin, 1831–70. Kazanskii, A. P. Uchenie Aristotelia o znachenii opyta pripoznanii. Odessa, 1891. Buzeskul, V. P. “Afinskaia politiia” Aristotelia kak istochnik dlia istorii gosudarstvennogo stroia Afin do kontsa 5 v. do n. e. Kharkov, 1895. Karpov, V. Naturfilosofiia Aristotelia i ee znachenie ν nastoiashchee vremia. Moscow, 1911. Zelinskii, F. F. Pedagogicheskie vozzreniia Platona i Aristotelia. Petrograd, 1916. Losev, A. F. Kritika platonizma u Aristotelia. Moscow, 1929. Aleksandrov, G. F. Aristotel’. Moscow, 1940. Kechek’ian, S. F. Uchenie Aristotelia o gosudarstve i prave. Moscow-Leningrad, 1947. Reuel’, A. L. Ekonomicheskoe uchenie rabovladel’cheskogo obshchestva. Moscow, 1959. Asmus, V. F. “Iskusstvo i deistvitel’nost’ ν estetike Aristotelia.” In the collection Iz istorii esteticheskoi mysli drevnosti i srednevekov’ia. Moscow, 1961. Zubov, V. P. Aristotel’. Moscow, 1963. Dovatur, A. Politika Politii Aristotelia. Moscow-Leningrad, 1965. Bonitz, H. Aristotelische Studien, [parts] 1–5. Vienna, 1862–67. Maier, H. Die Syllogistik des Aristoteles, parts 1–2. Tübingen, 1896–1900. Brentano, F. Aristoteles und seine Weltanschauung. Leipzig, 1911. Ross, W. D . Aristotle. London, 1923; 5th ed., 1956. Robin, L. Aristote. Paris, 1944. Allan, D. D. The Philosophy of Aristotle. Oxford, 1952. Bonitz, H. Index Aristotelicus. Berlin, 1955. Theiler, W. “Die Entstehung der Metaphysik des Aristoteles.” Museum helveticum, 1958, year 15, fasc. 2. Totok, W. Handbuch der Geschichte der Philosophic, vol. 1. Frankfurt am Main, 1964. The Greek philosopher Aristotle was the first person to write in detail about the connection between dreams and the human soul. The first systematic treatises on the nature of the soul and dreams are to be found in the philosophical writings of Aristotle. Aristotle was the third of a succession of great philosophers (the other two being Socrates and Plato) who are together considered the fathers of Western thought. Born in the Ionian city of Stagira in Chalcidice, Aristotle (384–322 B.C.E.) was the son of Nicomachus, the court physician to Amyntas III, king of Macedon. After his father died, he was brought up by the guardian Proxenus, who sent him to Athens. In 367 B.C.E. he entered Plato’s Academy, where he remained until Plato’s death in 347 B.C.E., and then joined a circle of Platonists living at Assos, in the Troad (an area surrounding the ancient city of Troy), under the protection of the tyrant Hermias of Atarneus. After three years, Aristotle moved to Mytilene, on the island of Lesbos, and in 342 B.C.E. he accepted an invitation to supervise the education of Alexander III—later known as Alexander the Great—at the Macedonian court at Pella, where he spent three years. After spending the following five years at Stagira, he returned to Athens, where he opened a new school called the Lyceum. When the school was in danger of attack from the anti-Macedonian party at Athens after the death of Alexander the Great in 323 B.C.E., Aristotle took refuge in Chalcis, on the island of Euboea, where he died the following year. Aristotle’s writings can be classified as popular writings, memoranda and collections of material, and scientific and philosophical treatises. Among Aristotle’s most important popular writings were his dialogues, which were based on the Platonic model, and what he refers to as “exoteric writings.” None of his popular works and not many of his philosophical works—such as Eudemus, Protrepticus, On Philosophy, On the Good, and On the Ideas—survived except in quotations and references in later works. The memoranda and collections of material contain 158 constitutions of Greek states, a record of dramatic festivals known as the Didascaliae, and Problems and History of Animals. Only a few of these works survive, such as the Constitution of the Athenians. Among the scientific and philosophical treatises, which constitute the largest surviving segment of Aristotle’s writings are the psychological works De Anima and Parva Naturalia. According to Aristotle the object of psychology is to discover the essence and the attributes of the soul (psyche), which to the Greeks referred to the realm of human consciousness and subjectivity. He developed his doctrine of the soul through three different approaches, characterizing the three periods into which his thought is usually classified. The first approach, which corresponds to the period of his earliest writings (through 347 B.C.E.) in which he was an enthusiastic defender of Platonism was characterized by a Platonic concept of the soul as a separate substance. Aristotle’s second approach, reflecting an increasingly critical attitude toward Platonism and marking the period from 347 to 335 B.C.E., was characterized by his view of the body as the instrument of the soul. This view of the soul and the body can be found both in the biological treatises and throughout the Parva Naturalia, in which the soul is given a physical basis and located in the heart, considered the central governing place of the body. In Aristotle’s final period, beginning in 335 B.C.E., during which he embraced the principle of empirical science and rejected all the essential features of Platonic metaphysics, he developed a theory of the soul as a form of the body, an extension of his earlier theory of the body as the instrument of the soul, which he postulated in Metaphysics. In the treatise De Anima, the soul and body are treated as constituting a single substance, standing to each other in the relation of form to matter. In De Anima, Aristotle presents a detailed analysis of the faculties of the soul, which, according to him, form a hierarchy, with the highest faculty, intelligence, found only in man, so that living creatures can be classified in a series according to the number of faculties possessed. Each kind of soul presupposes all that come before it in this order, but does not imply those that follow. The minimal soul is the nutritive, existing in all living beings. It is followed by the sensitive soul, existing in all animals and including the perceptions of touch, taste, smell, hearing, and sight. Besides the function of perceiving, the sensitive soul also has the function of feeling pleasure and pain, and therefore of desiring. There are two other faculties, regarded as outgrowths of the sensitive one: imagination and movement, which can be found in most animals but not in all. Finally, there is the highest faculty, reason, peculiar to human beings. Imagination is considered the repercussion of perception, both in the body and in the soul, and is described as operating only after the sensed object has disappeared. The main functions of imagination are the formation of afterimages and the process of memory, which is a function of the faculty by which we perceive time and which is impossible without an image. Another important function of imagination is dreams, which are the product of imagination during the state of sleep, and a by-product of previous sensations, since the impressions produced by our senses linger after the senses have ceased to be active. This is evident in the sensuous content of dreams whenever senses themselves are inactive. During the state of sleep, characterized by the absence of stimulus from without, the mind is more free to attend to images and, at the same time, more liable to be deceived by them. Aristotle deals with this subject in a systematic way in three treatises on sleep and dreams, De somno et vigilia, De insomniis, and De divinatione per somnum. According to Aristotle, sleep and waking, the examination of which is indispensable for the understanding dreams, are two states of the same faculty, whereby waking is the positive and sleep is the negative state. The waking state is determined by activation of the primary or commonsense faculty, the sleeping state by its inactivity. This inactivity of the commonsense faculty can be considered the ultimate cause of dreaming. The description of sleep as inactivity of the primary or commonsense faculty is presented in De somno et vigilia, in which Aristotle considers sleep and waking as affections of soul and body, taken as a whole. Soul is not considered something foreign to the body, and, during the state of sleep, it is considered capable of attaining the supernatural wisdom that is its original heritage. The heart, which is considered the source of functioning of all the bodily parts, is also the origin of sleep and walking, whereas the brain has a secondary function. In De insomniis, Aristotle speaks about the illusion of “sense-perception,” which, in sleep, is due to the improper functioning of the senses, freeing the way for the forming of dreams, without correction by judgement or evaluation. Neither actual perceptions nor thoughts can form any part of the process of dreaming. Finally, in De divinatione per somnum, Aristotle denies that dreams may have a divine origin, and that they may be interpreted by reliance on supernatural skills. He maintains, rather, that they may be either causes of actions or symptoms of bodily disturbances, and that “divination” through interpretation of dreams is mainly the result of coincidence.